We began to distill Armagnac on the estate in 1980. 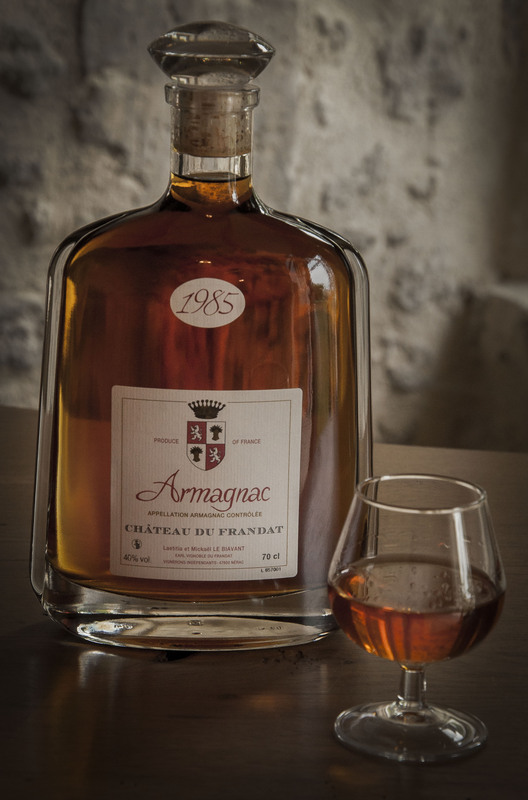 This is among the first Armagnac vintages distilled at the Château du Frandat. Our vines are situated on a wide plateau, on the heights of Nérac, Gascony. The grapes are harvested in a slighly under-mature state, to get a white wine around 9.5/10% alcohol, with high acidity. it therefore has a good capacity to retain all of its freshness and aromas until the distillation. The grapes harvested in September are pressed and the juice is left to ferment naturally without the addition of any oenological products. The white wine is distilled in December in a wood-heated continuous alambic. Distilled at 60 ° alcohol , it is immediately placed in 400-liters oak barrels. It is then aged for long years in which the alcohol evaporates (this is the " angels' share " ) and Armagnac takes a nice amber color. This vintaged Armagnac, bottled at the estate, will estonish you with subtle yet generous aromas of leather, cigar case and prune, with smoked oak notes. Its lenght in the mouth and the persistence of its aromas make this Armagnac an exceptional brandy.